The show was held in the Grand Palais, which Karl transformed into “Boulevard Chanel”, to set the show in a background resembling a European-style traditional sort of street. The clothes-I couldn’t find anything special about the clothes themselves, they were exactly, stereotypically what one would expect from a typical Chanel collection (except maybe more tweed). How the clothes changed throughout the show, however, is definitely something to take note of while watching the show, in regard of the message at the end of the show. What’s interesting though is that I’ve read plenty of reviews on the show(hello Refinery29 and Jezebel, both of which clearly weren’t buying the whole faux-protest theme, and The Cut, which seemed pretty neutral, and Fashionista and StyleList Canada, both of which praised Karl’s feminism festivity, and The Closet Feminist, which didn’t seem to keen on the idea but raised some interesting questions), and all of these reviews mainly hover on the slogans(which is understandable since I must admit some of them were TACKY) but none of them even mention or elaborate in detail on how the clothes developed and changed as the show went on. It’s funny because I actually thought the transformation of the Chanel pieces as the show progressed was one of the key factors to fully understanding the show itself and the story that Karl was trying to tell through this season’s show. At the beginning of the show, the models(all of which are women, except for one) are dressed in colorful tweed(SO, SO MUCH TWEED) and radiant ensembles of flowery, dotty patterns, reminding viewers of the 60s/70s. This changes, however, when at around 4:06, the music becomes more uptight and so do the models’ walking formation and the clothes. The flowery long boots and fluffy clothes are nowhere to be seen, and lines of models looking more fierce and modernized with boxy shorts and blouses and shiny, chunky gold belts start parading down the city-themed runway, and instantly I’m feeling like I just stepped into a new era of women’s fashion and am witnessing the evolution of women’s style. And then at 9:18, this jumpy crowd of women wearing the colorful fashions of the first half of the show are literally jumping down the runway, overwhelming me with all these hand-written slogan signs, many of them representing feminism. 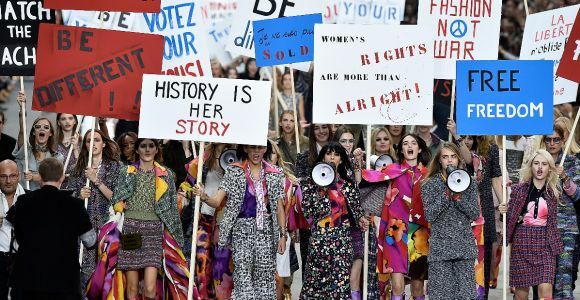 The feminist slogans helped me to reach the understanding that the contrasting 60s/70s –> modern clothing style transition in the show was a part of expressing feminism throughout the ages. It was a pleasant twist to the whole show. Women’s clothes have defined and shaped feminism, and I’m guessing that that’s what Karl was trying to portray through the transition in clothes (and obviously through the slightly tacky slogans, too). While I do agree with Refinery29 to some extent that the slogans were pretty ironically insignificant and, again, tacky, I still think the whole feminist movement reenactment was meaningful, in both the name of fashion AND feminism. 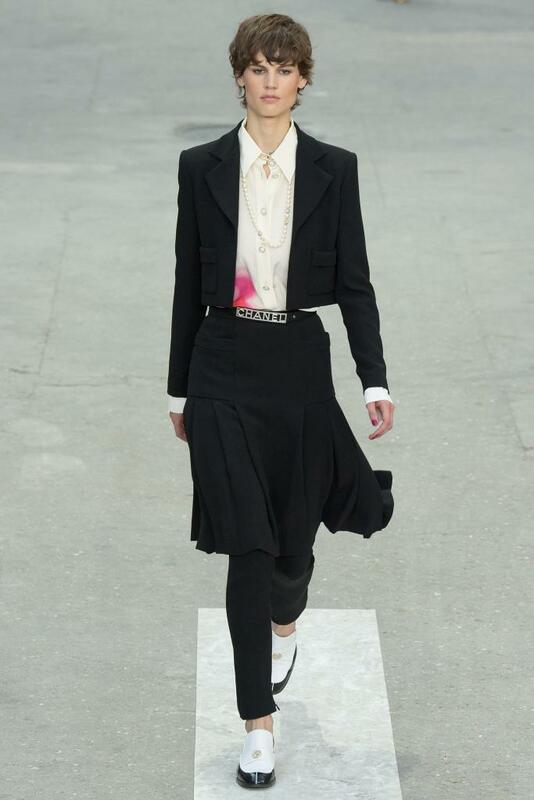 Chanel is receiving A LOT of criticism from people saying that the whole feminism thing was shallow and thoughtless, merely a trend, but I on the other hand loved it! Feminism is a concept that still needs to be embraced by many more around the world and the fact that a global, central, influential fashion brand like Chanel is marking the recent revival of feminist spirit just goes to show that fashion is still doing what it’s excelled at all this time-bringing us back to feminism. I don’t know what Refinery29 is getting at here. Why on earth would the selection of feminism as a theme make you feel “twisted”? Sure, there are definitely a lot of other serious issues going on on our planet, and I think feminism is always and has always been one of them, online AND offline. Is feminism an issue NOT “worth protesting” anymore? I think “Free Freedom” means that feminism is a type of freedom that has been locked up for so long and still hasn’t been fully freed, so Karl is making an ironic pun. Freedom is supposed to be free and natural, but feminism has not been in many places for such a long time. I disagree, Refinery29. You’re looking at the issue while holding an irrational grudge. What part of the closing act gives off the notion of “protest as pure product”…? (Well obviously except the fact that it’s a fashion show, although even that’s not that much of a rational conclusion to jump to either.) Of course we all know that Chanel is a company, which means it’s seeking to earn profit from selling clothes. But that doesn’t make it negative! If anything, Chanel should be praised for doing/representing something meaningful in the process. 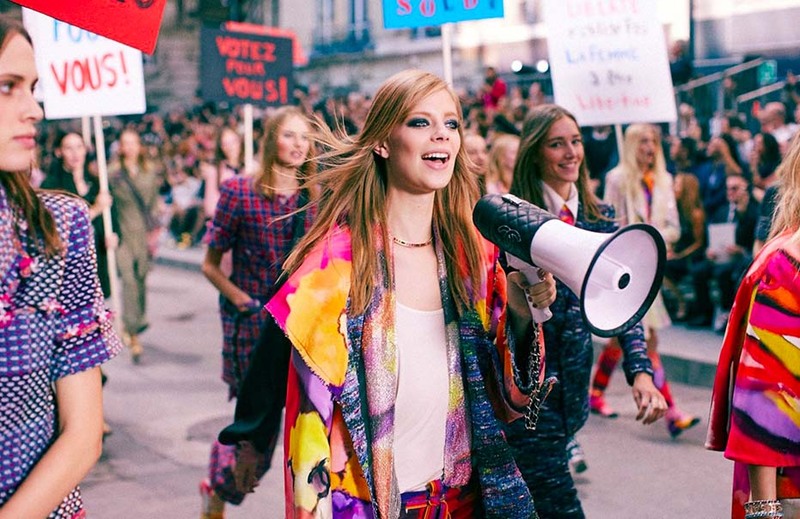 Fashion is one of the most effective ways to spread a message, and THAT’S what Karl knows. Like I stated waaay above in this post, I don’t think feminist slogans should have to include some sort of deep metaphor or whatever for it to be meaningful. People experience feminism and sexual injustice in many different forms and therefore it is expressed in many different methods of literary expression. Also, just a thought, but wouldn’t it seem more “gestural” or “trend”-like for Karl to implement totally cliché terms used in describing feminist emotions? Just sayin’. Cool! ❤ I love your blog, by the way!